I've been tormented since high school by a book called, If You Don't Know Where You're Going, You'll Probably End Up Someplace Else. We read it for a career seminar. Tormented, because I've spent a lot of time unsure where the hell I am going, and it has turned out to be true. It is also true that I didn't know until a couple of months ago that the title of that book is a quotation from Yogi Berra, who apparently, though I have never seen him, played some sort of sport and spoke in aphorisms. So it is fitting, and probably no coincidence, that the first chapter of Succeed: How We Can Reach Our Goals, by Heidi Grant Halvorsen, Ph. D, is called "Do You Know Where You Are Going?" I suspect that Heidi Grant Halvorsen, Ph.D., learned that quote was by Yogi Berra before I did. Or she got that book in her high school's career seminar and lived a directed, goal-oriented life ever after. Which is one reason she has a Ph.D and I don't. However, this isn't about me, it's about goals. After swimming around in the soup of success-defining, it’s about time to get to something concrete. Goals. Goals and setting ‘em. I think we can all agree that one definition of success is achieving goals. I’ve already posted once on Heidi Grant Halvorsen, Ph.D., former protegé and current colleague of Carol Dweck. As I mentioned then, the book has a lot in it, and I’m working on it. She writes well, and with humor. So maybe I ought to just quote extensively. Writing humorously about something someone else has already written about (somewhat) humorously, has proved challenging. I am all for a challenge, though, readers, yes I am! I’m all for challenge, for difficult goals. Difficult, but attainable, goals. This is the ideal goal, readers. A difficult, but attainable goal. All right, all right. Okay, so onward, through part one of Heidi Grant Halvorsen, Ph.D’s book. As an aside, let me just say, that she has a good name. Symetrical, initial-wise, and rhythmical to say, which must be why I always write her whole name, instead of calling her “Halvorsen,” in faux-intelletual mode, or “Heidi,” in insulting familiar mode. And Ph.D. Well. For these answer scores, a=2 and b=23. Two cubed equals 8. Why, I asked myself, did Heidi Grant Halvorsen, Ph. D., give this last answer this extra weight? The husband was irritated by this quiz, by the way, because he felt it, as are most quizzes in books of these sorts, was leading. So what about that 23? I mean, you will almost certainly get a score of at least 6, if you answer all five questions. Who wouldn’t? I suppose Heidi Grant Halvorsen, Ph.D,. is having a little joke on us. A little in-joke, perhaps? A little in-joke for Ph.Ds in psychology—and anyone with a Master’s in Education, or a passing interest in child development—mayhap? The answer to who wouldn’t get a score higher than six is someone who hasn’t passed the transition from concrete to abstract thought. Someone like my 10 year old daughter. Try it on yours, and let me know. Come to think of it, it's impossible to score less than 6 on this quiz. Even if you pick answers with a score of 1 for the first four questions, the least points you can accrue in the fifth is 2. 1+1+1+1+2=a leading question. Hmmmm. Let's return to the idea that a goal should be difficult, but not impossible. According to Heidi Grant H., Ph.D., people tend to do what’s expected of them, and not much more. So we ought to expect more and then we’ll get it. And when we expect more of ourselves, and surprise ourselves by achieving it, then we set up a “high-performance cycle,” (p. 7), which increases our motivation to keep on working towards difficult, but not impossible goals. What does the abstract/concrete dichotomy have to do with this? H. G. Halvorsen, Ph. D, adds that abstract goals are why-focused, and concrete goals are what-focused. 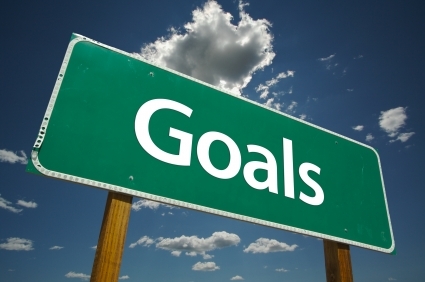 Well, apparently, we all tend to think about distant goals in abstract terms. Like, Hey, yeah, of course I want to enroll in that evening class to learn computer programming next summer—sign me up. For next summer. When we’re more abstract, we’re more focused on the reasons why we want to do a particular thing. In the short term, we tend to be more concrete. This can work against us. Like, Hey, what do you mean I won a free course in computer programming and it starts day after tomorrow—no way, I can’t do it. I have to rearrange my manicure and find someone to watch the kids, and I’ll miss my Zumba class. So, no thanks. As with most dichotomies, they have their ups and downs, and their plusses and minuses, and their uses and abuses. And here’s some advice, via HGH, Ph.D: once you have your difficult, but not impossible goal, you use your concrete skills to establish your first step. You use your abstract abilities to motivate yourself—I’m going to learn computer programming so I can hack into ETS’s mainframe and screw up their standardized tests so our kids won’t have to waste so much time taking them next year. And you can use your concrete abilities to focus on the nitty-gritty—I’m going to take the subway to the bus to the elevator to the registration desk and sign up for that computer programming class tomorrow afternoon and then reward myself with a manicure. You use your abstract, why-thinking, to keep you motivated towards a goal, and you use your concrete, what-thinking, to help you step-by-step through the challenges that arise in pursuit of that goal. The upshot is you need both what-thinking and why-thinking. Because in setting future goals, we tend to be a little over-confident that we will have the time and the energy and the motivation. Like, after just one computer class I’ll be able to hack into the Educational Testing Service’s computers. It’ll probably take more than one. So we need our concrete what-thinking to help us see that we’re going to actually need a whole degree before we can hack into the mainframe, and a degree starts with a single credit, so let’s get this show on the road. Thanks for the great post. I also love the book "Succeed." Just a little correction about the points assigned to the questions. The last question 5b is actually not counted as two cube. The assigned value is 2 but the number 3 references the article she adapted the items from (See references at the back of the book, Chapter 1, Ref 3. It's basically a referencing style. Hope this helps. Thanks for the correction. I checked out my copy of the book, and I think you're right. Oopsie! However, the number is poorly placed.